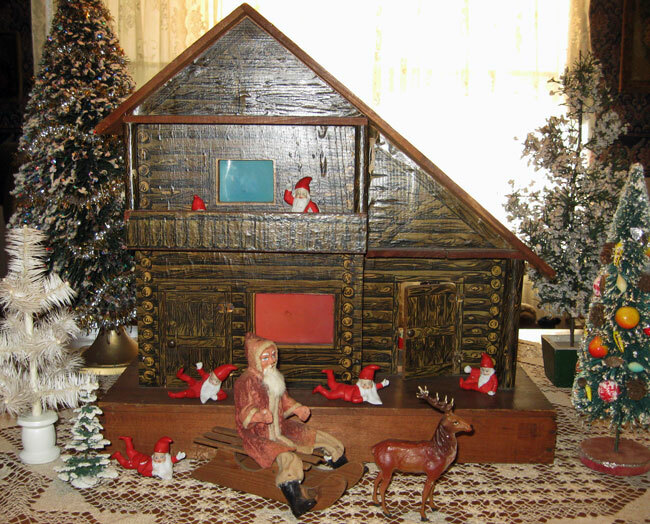 New to our Christmas display this year but not new to our collection is this Bliss Adirondack Cottage circa 1905. When we bought it from a small local antique shop almost three years ago, we weren’t sure how to display it, but we said even then that it would make a great Santa Claus workshop. That vision was finally realized this year. Here you see the front of the cottage with German bisque elves playing on the upper and lower porches while a nice old composition German Santa sits on his wooden sled. Here you see the back of the cottage just filled with toys and decorated Christmas trees and another playful elf. We have loved Bliss doll houses from the moment we first saw them early in our collecting years, and we have been fortunate enough to acquire about four of them at affordable prices. Bliss doll houses are characterized by their wood construction and beautiful chromolithographed paper coverings. The peak of production was at the turn of the century, and the most elaborate houses are beautiful miniature renderings of highly Victorian-style houses in all their gingerbread glory. This “cottage” is unusual and, we believe, rare because it is quite simple in style and decoration. The very realistic-looking logs are, indeed, just printed paper. Rufus Bliss went into business as a carpenter in Pawtucket, Rhode Island back in 1823. He was highly skilled and inventive in his carpentry techniques, becoming best known for his lathe-turned wooden screws and clamps. He took on a partner, A.N. Bullock, in 1845 and the name of the company became R. Bliss and Company. In 1867, several years before the company first advertised the making of toys, Mr. Bliss withdrew from the business. In 1873, Mr. Bullock died. However, the company continued on with Mrs. Bullock retaining an interest, and a stock company involving Bullock family members among others was formed in 1874. The company continued to make practical things like wooden screws, clamps, and tool handles, but they expanded further into croquet sets, tennis racquets, and paper-lithographed toys. Today, their doll houses, wooden boats, and pull-toys are among the most prized and expensive of American antique toys. A Massachusetts company bought out the toy-making end of the business in 1914 and kept the name, but it ceased production in 1935. This entry was posted in 1800's, 1900's, 1910's, Americana, Carol, Christmas, Dolls, Holiday, Miniatures, Toys. Bookmark the permalink. The first time that I saw one of these Bliss log cabin dollhouses was about 5 years ago on Ebay. I was unaware of who the maker was or any of its history until recently. Last Spring I was thrilled and very fortunate to obtain this dollhouse from Ebay. I have only seen it twice for purchase and the 2 different ones on this Bliss Dollhouse site. I believe it is very rare and I was so surprised that not many people bid on mine or the other one I saw. Love it!! It is so unusual and rare! Again, I have collected many Bliss, Gottschalk, McLoughlin, Gutter, and Dunham Cocoanut dollhouses but this one is one of my very favorites. I was tickled to learn that it was produced in 1905 as that is the year that my beloved Gramma was born. The background history information was interesting with new facts that I did not know. I would be willing to send pictures of mine if you’d like. I decorated my log house as a frontier/late 1880’s house complete with a lead polar bear. 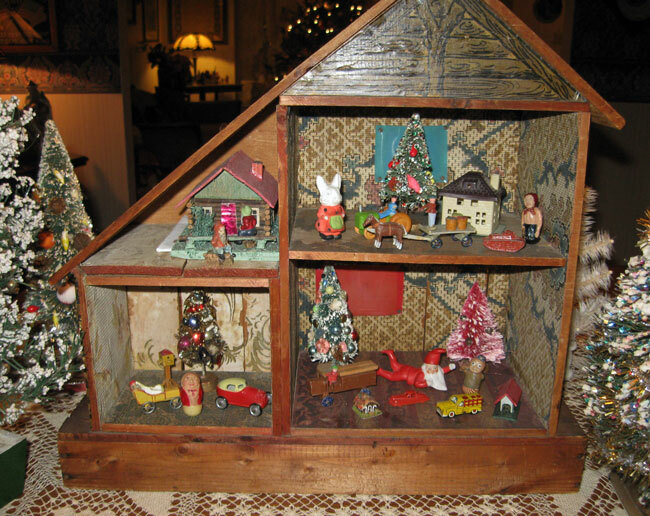 Best wishes to a fellow collector of dollhouses!